Jesus' life was about ministering to the lost. But ministering to others take commitment and time. How do we go about conducting ministry in a way that produces disciple of Christ? To minister as Jesus ministered is to serve with the supernatural freedom of self-sacrifice, giving ourselves for others. Experience The Life, a thirty-week life-changing series for groups, is composed of five books, each six weeks long. You'll learn how to read Scripture, think about what you read, pray over it, and live it out. Through studying God's Word, gathering with others, and learning to pray and journal, you'll experience true spiritual transformation and become like Christ. 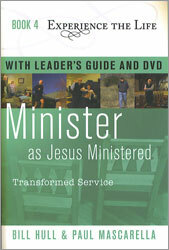 The leader's guide contains a complete participant's guide plus discussion questions for each gathering along with a DVD for use in introducing each session.